Maintaining warmth while outdoors is one of the hardest things to do. The UCAN! Emergency Sleeping Bag makes your job that much easier. Not only will it help retain up to 90% of body heat, but if you flip it inside out, it'll keep you cool. The sleeping bag is compact and lightweight, so you can take it anywhere. Buy 1 NOW! This thin material was designed by NASA to be user friendly, as well as water and wind proof. It was originally designed for space exploration! Though the size of a normal sleeping bag, it can be folded down to fit into a stuff bag the size of a can of soda or beer (your choice), under the seat of your vehicle or even placed in an emergency kit. It's durable and flexible, made of a PET film. Buy 2 NOW! The UCAN! Emergency sleeping can retain up to 90% body heat/ or reflect the sun's heat because of the PET material it is made of. High visibility orange on one side and aluminized PE material on the other. The emergency sleeping bag is waterproof, windproof, flexible, and tear resistant. The emergency sleeping bag is compact and light weight. In the included nylon stuff sack, it is the size of a 12oz. soda/beer can and only weighs 4.6oz. 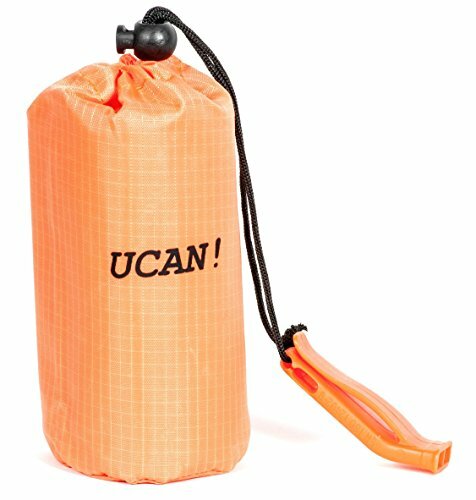 The UCAN! Emergency sleeping is reusable and includes a nylon stuff bag for easy storage and a very loud orange whistle to attract help. The FREE whistle is a one piece design to prevent failure and work when you need it to. If you have any questions about this product by UCAN!, contact us by completing and submitting the form below. If you are looking for a specif part number, please include it with your message.